We all know kids love to use their imaginations when it comes to play, I know I always find my kids building things out of the toys they have such as blocks and playsets, interacting with eachother and learning as they go. We have had Mega Bloks in our house since our first child was born. We started out with a small collection of the bigger Mega Bloks for younger kids and now have a bunch of sets for different ages including the new Blok Squad buildable playset! 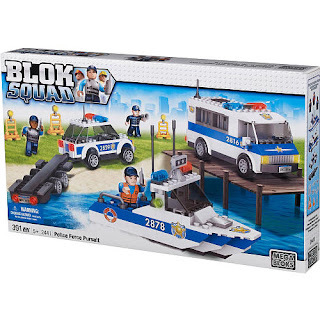 Blok Squad buildable playsets from Mega Bloks introduces kids to every day heroes with themes like fire patrol, police and construction. Blok Squad is perfect for kids aged 5 and up who are ready to graduate from mini bloks to micro bloks with more challenging and detailed builds. We received the Mega Bloks Blok Squad Police Rescue Play set to review. 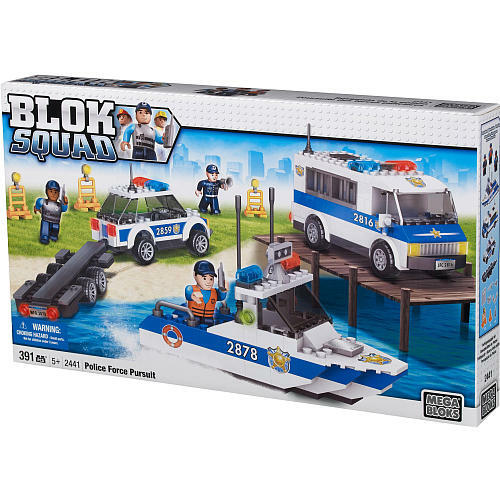 The play set includes Police Force Pursuit team of Police Cruiser, Police Carrier and Police Boat with three Blok Squad Officers. It's made for ages 5 and up with 391 pieces! Sound the alarm; it's time to send the best of the Bloktropolis Police Squad and help save trapped city folk from a bank robbery in an emergency rescue! Kids will have a blast as they build the rescue vehicles and police cruisers to roar through the streets of Bloktropolis, carrying the bad guys to prison and the city folk to safety!. Its up to the Bloktropolis police to save the day, with the help of your little ones imagination! What I like about Mega Blok brand building sets is that they allow the imagination of your child to soar, learning and using their fine motor skills in the process. The only downfall to Mega Bloks Blok Squad is that like every block set out there it has a bunch of pieces to keep track of to keep the set together. For a child as young as five years old my suggestion would be saving a toy like this for a rainy day when mom or dad can participate and make it some real family time. To store things like this I re-use washed plastic food containers with lids. They help organize and your child will have less of a chance losing pieces as much as if you just stored them back in the box. Don't forget to check out the Mega Bloks Family Club! From August 16th to September 22nd, Family Club members will have a chance to win Rose Art back-to-school prize packs worth $50! In order to win each morning a question about Back-to-school will be posted in their "news" section, all you need to do is leave a reply with your own opinion and you will be automatically entered for a chance to win! It's that simple! After the 38th giveaway, everyone (win or lose) who has entered the contest will be put into a draw to win the grand prize of $250 in Rose Art back-to-school supplies! If you're not already a member visit www.megabloks.com/familyclub and start answering the daily question to win! You never know unless you try! RateSuperMarket.ca and a Starbucks Giveaway!